As I write this it’s 91 degrees in Charlotte, so it hardly feels like Fall. But, I saw pumpkins at the grocery store, Starbucks brought back the Pumpkin Spice Latte and the Halloween catalogs are in my mailbox, so the season is upon us! I grew up in Southern California where the seasons simply don’t change. It can be chilly and cloudy in June and hot and sunny in February. Leaves don’t turn colors and fall from the trees. The weather doesn’t gradually change from hot to warm to cool then cold. It could be all four in one day sometimes! Your sweaters hang next to your sundresses in California because you could wear them both in the same week. I didn’t own a winter coat or boots until we moved to Charlotte. I even had to invest in socks because we never wore them in California! But, Fall has become my favorite season. I love to drive down Colville Road under a canopy of red and yellow leaves. The humidity (finally) chills out and the air feels so refreshing. I can open my windows at night and fall asleep to the sound of crickets and wake to the sound of birds. I can get back in the garden and plant Fall colors and we can play outside without coating ourselves in bug spray! Fall also has a significant impact on my kitchen. I can get the Crockpot out for soups and stews and chili. And bread. I bake lots of bread when the temperature drops. 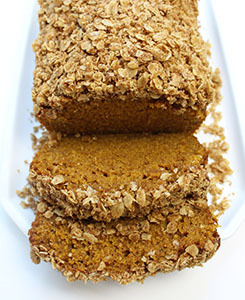 Of course, pumpkin bread is a Fall favorite and so I offer you this recipe in celebration of the season. I hope you enjoy it with the windows open, a nice view and a warm cup of coffee! Just look at these spices! And your kitchen will smell soooo good while this is baking! It’s going to be hard to resist cutting into this bread as soon as it comes out of the oven. I know. Preheat the oven to 350 degrees (F) and place the rack in the lower third of the oven. 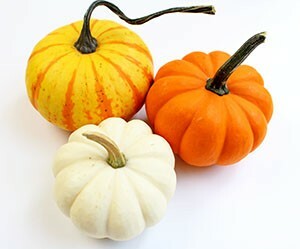 In a large bowl, whisk together the pumpkin puree, eggs, oil, vanilla and sugar. 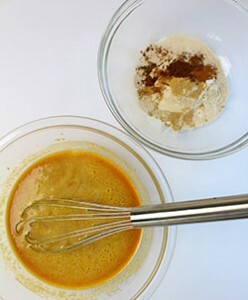 In a medium bowl, whisk together the flours, salt, baking soda and spices with a fork until combined. Grease a standard loaf pan with oil or cooking spray. Pour the batter into the loaf pan and bake 15 minutes. Meanwhile, prepare the streusel. Stir together all streusel ingredients with a fork or your hands. 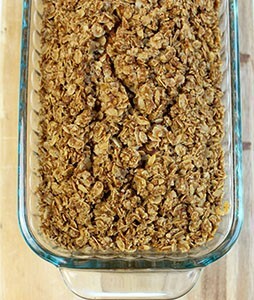 The mixture should not clump, rather, it will resemble a loose granola. 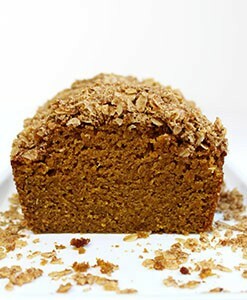 After 15 minutes of baking, remove the loaf from the oven and sprinkle the streusel on top, pressing down gently so the streusel sinks into the bread a bit. 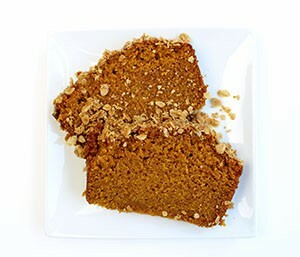 You will have more than enough streusel. I typically use 2/3 of the mixture and reserve the rest for serving. Place the pan back into the oven for another 45-50 minutes or until a toothpick inserted in the center comes out clean. The streusel will brown just slightly, but if you feel it’s getting too crisp, tent the pan with foil. Remove from the oven and allow to cool in the pan about 30 minutes. Turn the loaf out onto a sheet of wax paper to cool completely. The trick to not losing your streusel is to turn the loaf out onto one plate (so it’s upside-down), then place another plate against the bottom of the loaf and flip again (this time it will be upright). I store this bread wrapped in foil at room temperature for about three days. It usually gets eaten quicker, though! Bring Back the Dinner Party!